As soon as I was told our theme for this month’s Progressive Eats was cupcakes and to think outside the box, my brain went straight to savory goodness. And cheese. And pepperoni. 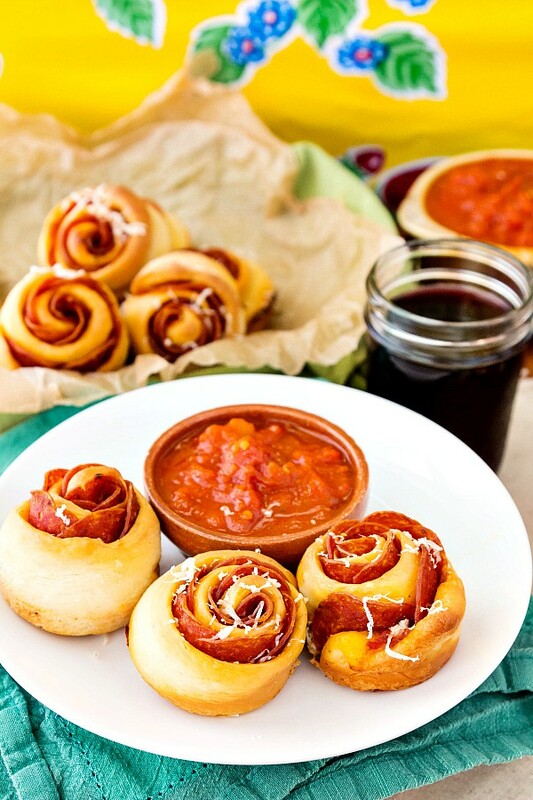 Spicy pepperoni pinwheels. Let me show you how easy it is to make them! If you’d like, you can jump straight to the recipe. I love to make food with a lot of Steps. You know. Make frosting. Make cake. Make syrup to brush on cake. Make filling. Make garnish. Assemble cake. Steps. So while a lot of my food can be somewhat time-consuming to put together, I don’t generally make fussy food. Decoration is pretty minimal. I don’t deal with fondant or sugarpaste flowers so much these days. Milkshakes garnished with caramel corn, cupcakes and waffle cones don’t really happen here. So, overlapping pepperoni slices on thin strips of dough and then rolling them up into spicy pepperoni pinwheels and letting them rise in muffin tins? Not generally on my radar. 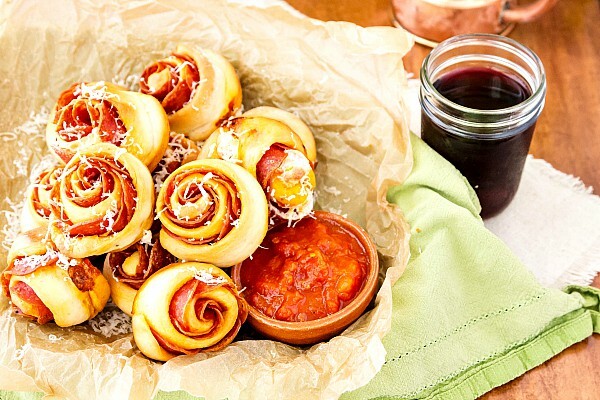 Yet, since it’s Liz‘s turn to host Progressive Eats, and you all know how much I want to be Liz and make elegant dishes like she does, the spicy pepperoni pinwheels idea just wouldn’t leave my head. So I went the extra mile for these little guys. Thanks for inspiring me to do more than I normally would, Liz! Since I made a dozen of these guys, I tried three or four ways of making them. The most consistently pretty results (and the ones that had the best flavor) were the ones I made with whole slices of pepperoni, and I’ll outline only that procedure in the recipe. Suffice to say I used pepperoni halves, two-thirds, folded up dough and What Not before I realized that simplest was best. Tada! You ready? I hope so, because these guys are great and are perfect for a fun twist on pizza night. Boy, do these look amazing, Jenni! All my favorites rolled in one! What can I say? You inspire me to make my food delicious *and* pretty! This was such a fun theme this month, Liz! Thank you for hosting! What a delightful and delicious way to make savory pinwheels even more fun! You are always so creative Miss Jenni! Thanks, Jane! I had thought I was being very inventive, but The Google told me otherwise. Alas. lol Still, they were delicious and fun to make! These beauties would be a hit at any party! They sound wonderful!!! What a fun idea for a party – love how creative these muffin tin recipes are for this month’s Progressive Eats! I would like at least 6… Lord, these sound yummy! Victoria would go mad for them! They are stupidly good. I ate 2. Or 3. I don’t remember. I was in a haze of pepperoni goodness. I had to send the rest with Jeffrey to work today! I am very confident to say that I know these savory treats will not disappoint! I make your pepperoni bread very often, but not often enough for my family! I will be making these very soon! Thank-you… Again! I don’t know what is wrong with me but I’ve never liked Pepperoni; it’s probably why I quickly gravitated to white pizza instead of the more traditional variety. That being said…there is no reason I couldn’t incorporate something else in the pinwheel creation; you say pepperoni and I think prosciutto! I do love they way they turned out and they would be a great summer party item. Thanks Barb! Pepperoni is one of those nostalgic things for me. The flavor reminds me of watching the player piano at Shakey’s pizza when I was a kid. I know that any cured meat would love to take pepperoni’s place in these little guys, though!